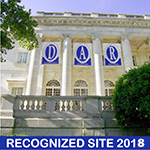 The John Abston Chapter National Society Daughters of the American Revolution (NSDAR) invites you to explore our website and find out more about DAR. 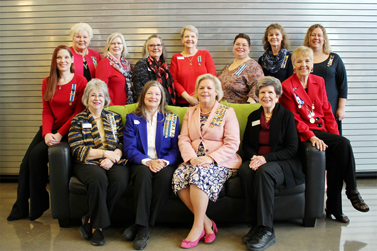 Founded on October 17, 1975, by a core membership of 20, the John Abston Chapter, NSDAR celebrated our 40th anniversary in 2015 with more than 200 members. 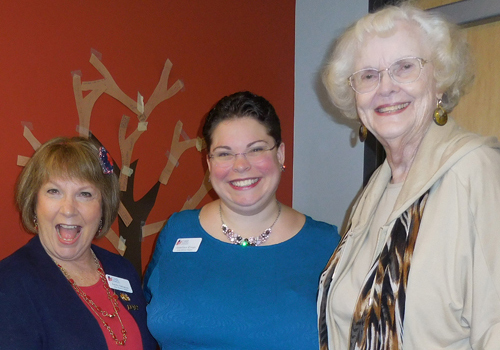 Today, we are pleased to welcome women of all ages to our fun, informative, and community service-driven meetings. Please contact us for more information about membership and be sure to let us know when you'll be visiting our next meeting - we'd love to meet you! 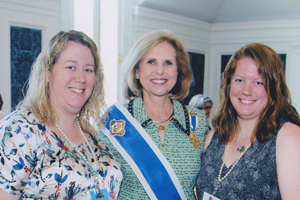 The DAR is open to any woman who is at least eighteen years of age and can prove lineal blood line descent from an ancestor who aided in achieving American independence. Juniors are members age 18-35 and the future of DAR. 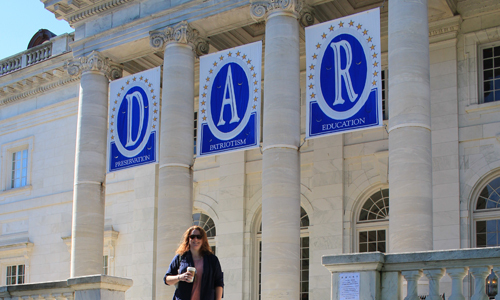 DAR provides Juniors opportunities to grow personally and professionally, and form lasting friendships with Daughters across the state, the nation, and the world. DAR members are women a lot like you, who come from diverse backgrounds and have a variety of interests. Their common bond is their lineal descent from patriots of the American Revolution. Any woman 18 years or older who can prove lineal, bloodline descent from an ancestor who aided in achieving American independence is eligible to join the DAR. We are women who care about fostering good citizenship, honoring our ancestors, educating our youth, and preserving our past for future generations. 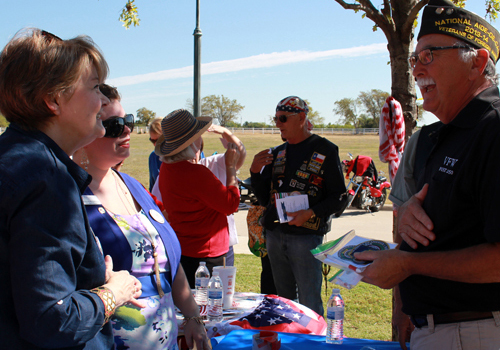 The John Abston Chapter, NSDAR membership is just as varied in their backgrounds as our patriots. 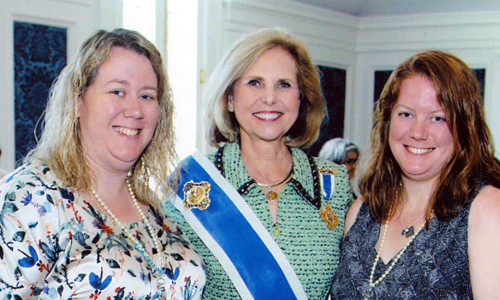 With more than 250 members and an active Junior membership, John Abston Chapter, NSDAR is making strides to make a positive influence in our local communities. 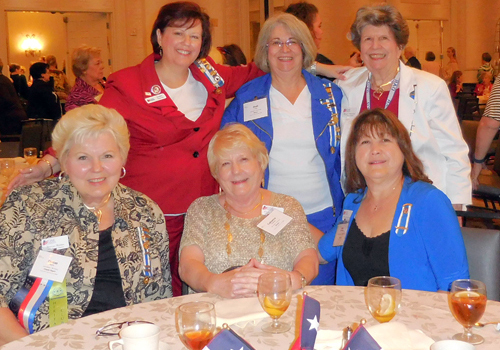 Chapter members have served on the state level as chairs and vice-chairs for several committees. For more information, contact the John Abston Chapter, NSDAR Registrar, Cathy Leiker or by completing the contact form. 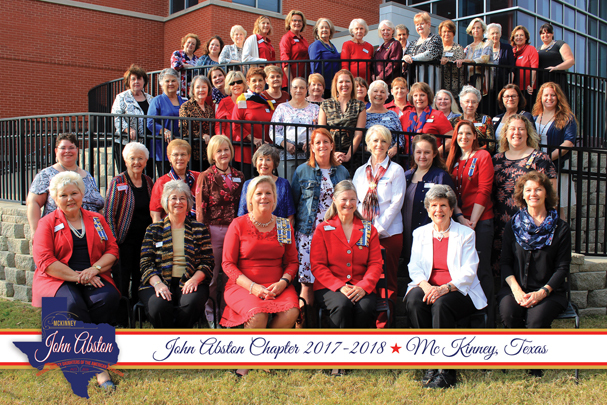 The John Abston Chapter, NSDAR was organized by 20 women October 17, 1975, and has the special distinction of being named after one of only two patriots whose graves in Texas are known to be marked by the Daughters of the American Revolution, Sons of the American Revolution, and the State of Texas. To learn more about John Abston, you can read his story in the History of Our Namesake. 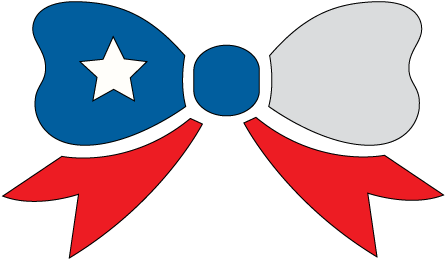 The Chapter Patriots is a list of the chapter membership's ancestors who provided civilian, patriotic or military service during the American Revolution. William Tyler Page pays tribute in "American’s Creed" to the men and women who risked “their lives and fortunes” to establish a nation on the “principles of freedom, equality, justice, and humanity.” It is our duty to honor their sacrifices, preserve their history, and not take for granted the freedoms for which they fought. Amos Sherwood Thomas Stevens Jr.
Much of our information about John Abston has been passed down as family oral tradition. While some of the original records and sources of information have been lost over time, the details contained in this article represent our best understanding of the history of John Abston. Further study and research of these details is a matter of ongoing study. A friend of Colonel William Washington, he fought alongside and under men like John Crockett (father of Davy Crockett), Isaac Shelby, John Sevier, William Campbell, Colonel Benjamin Cleveland, and Colonel Joseph McDowell at the Battle of Kings Mountain. Serving more than two years in the Continental Army, he fought in one of the most pivotal battles in the Revolutionary War that kept the spirit of the patriots strong in the southern colonies. Abston fought in the Battle of Kings Mountain in Captain Rose’s company under Colonel William Washington and the story handed down through the Abston family is as follows and related in J.P. Cranke's "The Indian Play At Kings Mountain" article in the Daughters of the American Revolution Magazine Volume 55 Number 11 published in November 1921. “The detachment of Colonel Washington had marched steadily for two days and nights with the balance of the mountaineers from the slopes of the Alleghenies. They had very little to eat during this last 48 hours, having already consumed the rations with which they had supplied themselves before starting from their homes. The morning they came up with the enemy they were all but famished, and Washington, knowing the necessity of having his men fed before going into action, was much concerned. It was the good fortune of John Abston to save the day and relieve the anxiety of his commanding officer. He was scouting in advance of the main body and luckily ran upon a fat steer in the woods, one of the few that had escaped the British foragers. He immediately transformed himself from scout to commissary and drove the steer back to his command, where he was received with shouts of delight by the men. The beef was quickly butchered and the men cooked and ate their breakfasts. Then, with much dignified ceremony, there in the presence of the enemy which they were about to assail, William Washington presented to John Abston one of the horns of the steer as a memento of the occasion and the signal service he had performed. He carried it with him through the battle, and after the close of the struggle, preserved it as a remembrance of his gallant colonel. After the war, Abston married Frances Thurman and moved his family westward in search of the “proper amount of space a gentleman’s estate should occupy.” Settling in Kentucky and Missouri for a time before moving to Collin County, Texas, with his son, Jesse, his son’s wife, Sarah, and their children in the early 1850s. Unfortunately, Jesse died of pneumonia shortly after arriving in Melissa, Texas. John and Sarah purchased land about a mile north of Lavon, Texas, in 1854. Abston died February 4, 1856-7, and was buried in the family cemetery. The John Abston Juniors are a fun group of young ladies that share a common love of service, education, and history. Juniors are DAR members under the age of 36 and are able to hold any position for which she is eligible. As Juniors, we enjoy additional opportunities to serve at the State and National levels only offered to us. 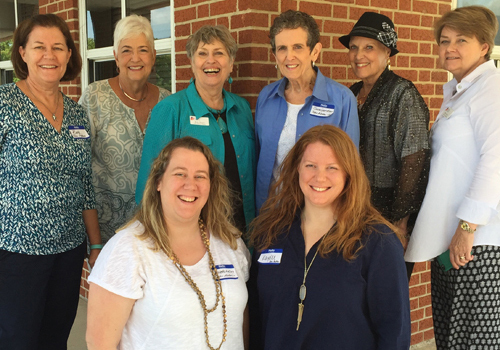 We meet at least once a month outside the regular chapter meetings to socialize, have fun, and make friends. I invite you to check out our service, activities, and mentor sections below to learn more about us. If you have any questions, we would love to talk with you. Please contact the chapter's Junior Membership chair Gretchen. We can’t wait to meet you! Community service is one of the areas of focus for the John Abston Juniors. We partner with various organizations in the McKinney area and facilitate the chapter’s National Day of Service event. This year, we are partnering with CASA of McKinney. 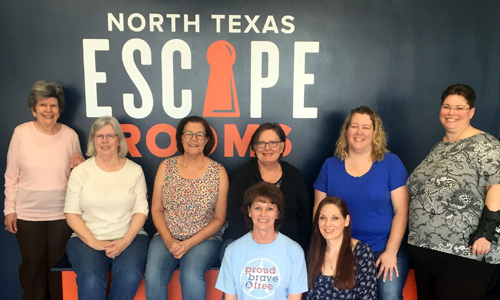 In the past we have worked with the Samaritan Inn, Title I schools, McKinney Public Library, women’s shelters, and more. Forming lasting friendships and gaining experience in all things DAR are a couple of goals of the John Abston Juniors. This is one of the greatest benefits of becoming a DAR member during your Junior eligibility years. The John Abston Junior Membership hosts a Junior and Junior-At-Heart activity at least once a month. Some activities are just for fun and to create those lasting friendships while other activities are to support and celebrate the accomplishments of our Juniors outside of DAR. 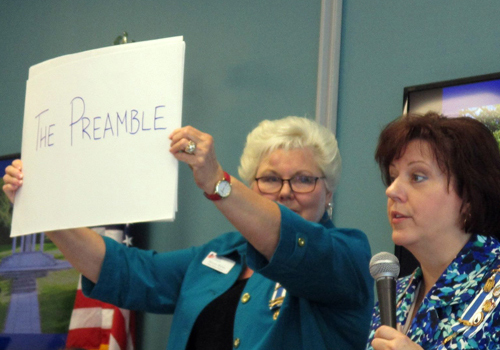 There is always a fun time to be had while Paging at Fall Forum, State Conference, and Continental Congress. 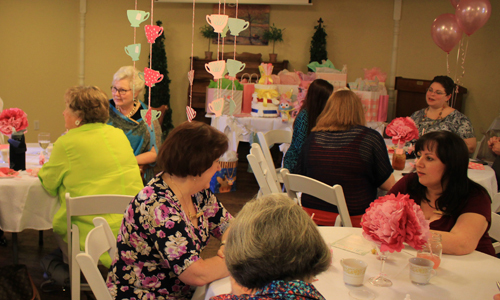 The Texas Society DAR hosts regional and state activities throughout the year that has included activities such as cookouts, shooting ranges, paint parties, jewelry parties, and more. We are some of the luckiest Juniors in the state, dare I say in the National Society. 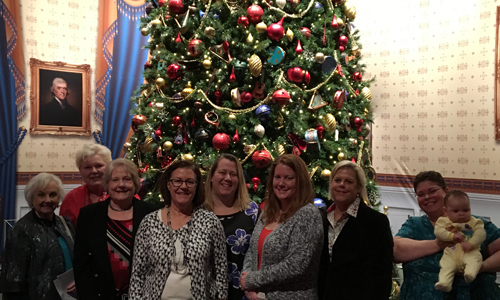 Our amazing chapter ladies act as mentors to us on our journey in DAR, life, and work. 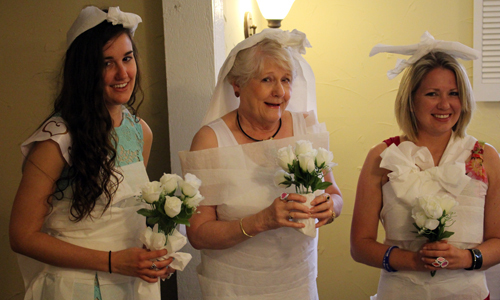 These ladies truly are our big sisters, caring aunts, and loving grandmothers. Our chapter loves its Junior members and supports us in all of our goals and projects. As we explore Junior membership, our Juniors are guided by our mentors into leadership positions and aid in our success as leaders. We can always count on our mentors as we travel the DAR path. Each year, the John Abston Chapter, NSDAR provides a scholarship to a graduating senior from one of the McKinney High Schools who plans to continue their education. The award is made through the McKinney Education Foundation to a student who demonstrates integrity, scholarship, leadership, and patriotism. We are proud to support our local graduates with assistance in furthering their education. Repairing and preserving the historic portion of the cemetery where John Abston is buried became the chapter regent’s project during the 2015-2017 term. Prior to the chapter’s work, the stones in the historic portion of Lake View Cemetery in Lavon, Texas, were in disrepair. 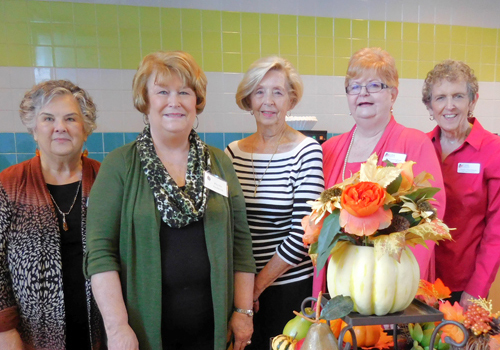 The first phase was funded by making a quilt and selling chances to win the quilt, and with grants from Chevron awarded to Teena Humphris, a Chevron retiree, for her volunteer work with the chapter. The second phase of preservation focused on leveling, cleaning, and repairing 12 stones. The final phase completed the cleaning and restoration of the remaining 10 stones. 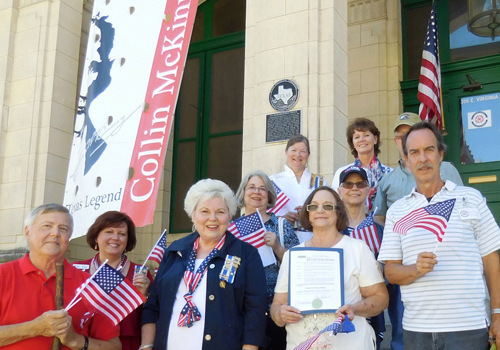 Both of these phases were funded by the Collin County Historical Commission in 2017. Since the National Society’s inception, service has been one of the pillars of the Society’s identity. Daughters across the Society collected more than 14.3 million documented volunteer hours during the 2014-2016 Young administration with more than 3.9 million hours and counting for 2017. 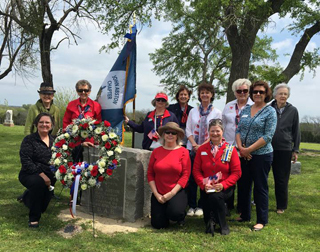 On the anniversary of the founding of DAR, Daughters participate in service activities across the nation. 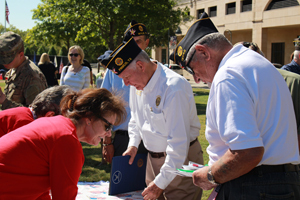 John Abston Chapter, NSDAR has participated every year. 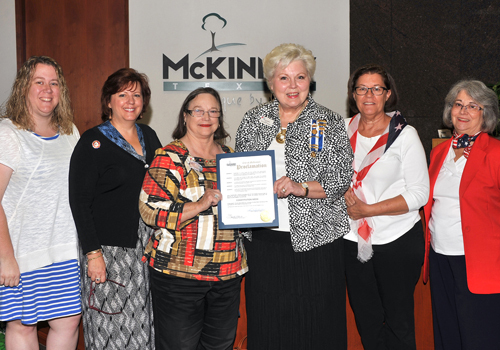 In 2016, the chapter honored the spirit of service in celebration of the National Day of Service by collecting as many gift cards possible for CASA (Court Appointed Special Advocate) of Collin County in a 10 day period. Our ladies out did themselves by collecting donations for needed supplies or celebrate special occasions for kids/teens in the CASA program. DAR Sets GUINNESS WORLD RECORD™ for Patriotism! To celebrate the National Society’s 125th Anniversary and the culmination of the "Celebrate America!" 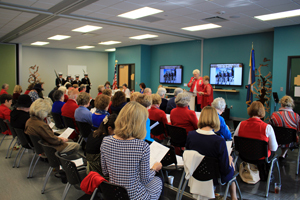 volunteer service initiative, the DAR channeled its fervor for patriotism and dedicated support of our nation’s military service members toward an ambitious goal. During the week of the 125th Continental Congress, held in June at DAR’s Washington, D.C., headquarters, the organization set an official GUINNESS WORLD RECORDS™ title in patriotism for “most letters to military personnel collected in one month.” The DAR had collected 100,904 letters, more than 10 times the minimum threshold needed to set the record for most letters to military personnel collected in one month! 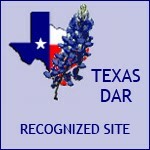 Site maintained by Webmaster | Please contact us at John Abston Chapter NSDAR.